Hey guys! I'm new here but I am owned by several parrots! I'll make an intro thread in a little bit. 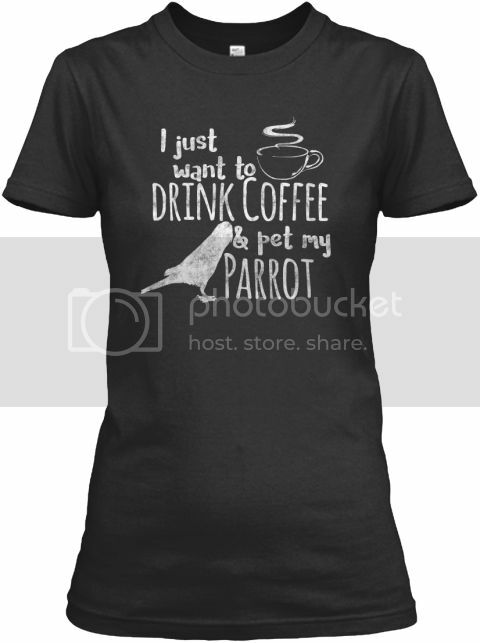 I really wanted to share the shirt I designed with fellow parrot lovers! I just couldn't find one I liked so I made one! Hope you like it and I would love some feed back. There is also an amazon one that I made in honor of my own Amazon, Rudy. Last edited by Anansi; 09-15-2016 at 04:53 PM. Reason: Replaced link with image. For sure! But you know how it goes with parrots, they want to try to drink your coffee too! Haha! My green cheek, Serafina has to be locked up when I have my coffee or she dives right in the mug! Goof ball.